Auction proceeds to benefit the Robert F. Kennedy Center for Human Rights. 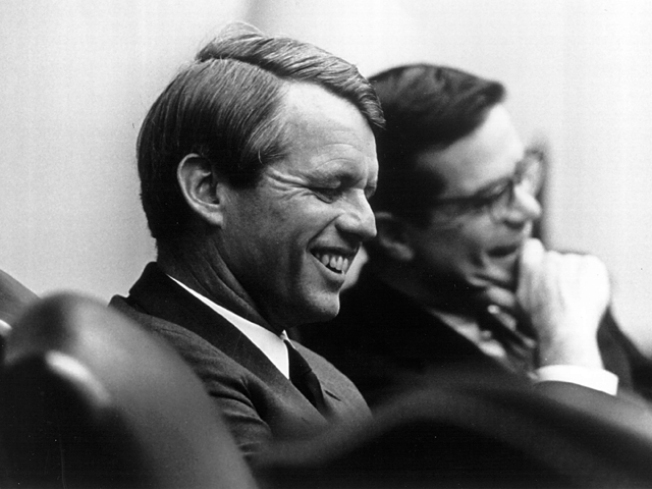 On the 40th anniversary of his death, Robert F. Kennedy remains a presence in the state he represented as senator from 1965 to 1968. Falconing with Robert F. Kennedy Jr. or singing with Aretha Franklin. Touring the Kennedy estate and sailing in Hyannis Port. Dinner and a movie with Alec Baldwin. These are some of the lots for a holiday auction benefiting the Robert F. Kennedy Center for Human Rights founded by Kerry Kennedy, daughter of the late New York senator and U.S. attorney general. "The first issue we need to address as a nation is restoring our moral compass in the world," said Kennedy, a human rights activist who was only 8 when her father was assassinated in 1968 while running for president. On the 40th anniversary of his death, he's still a presence in the state he represented as senator from 1965 to 1968. The star-studded online auction that runs through Dec. 8 follows the renaming of New York City's Triborough Bridge as the Robert F. Kennedy Bridge. Former President Bill Clinton, Gov. David Paterson, Mayor Michael Bloomberg and several generations of Kennedys attended the Nov. 19 ceremony in a Queens park under the bridge. Auction proceeds will fund the center's efforts both domestically and globally. "In 1968, when my father was running for president, the women's rights convention was not yet ratified," Kennedy said in a telephone interview Wednesday. "It's still not ratified in the United States of America." She said she's sure that with the nomination of Sen. Hillary Rodham Clinton for secretary of state, "you're going to see enormous efforts to empower women overseas as part of her agenda." Kennedy said the center's recent human rights victories include helping migrant workers win wage increases with fast-food employers, working with victims of Hurricane Katrina so they can return home, and introducing human rights education to 40,000 students in Italy's public schools. Among the items on the auction block is musical advice from Clive Davis, for a minimum bid of $18,500 as of Wednesday; lunch and a personal tour of a floor of the NBC network at Rockefeller Plaza, led by Luke Russert, son of the late "Meet the Press" host Tim Russert (at least $800); a tour of the Capital in Washington with Speaker of the House Nancy Pelosi (starting at $10,500); and a New York dinner with James Earl Jones, Ruby Dee and Harry Belafonte ($3,250 minimum). The singing session with Franklin is up for a minimum bid of $2,500. The Web-based company organizing the auction, Charitybuzz.com, is not charging any premiums on the auction prices. Kerry Kennedy will be there for two of the auctioned experiences: dinner and a movie with Alec Baldwin (at a minimum bid of $3,250), and dinner with Martin Sheen (at least $3,100). And she hopes to go along for the afternoon of sailing with her brother, Max Kennedy, off Hyannis Port that includes a tour of the home Robert and Ethel Kennedy shared there. Minimum bid: $9,250. Her brother Robert, now an environmental lawyer, had taught her the sport of falconing near their childhood home in McLane, Va.
"It's a beautiful walk through the woods with a bird on your arm," she remembers. The falcon then takes flight and dives down after prey like squirrels and small vermin. The falconing being auctioned — starting at $4,501 — will take place near Robert Jr.'s home in Bedford, N.Y.
And the egg of another bird, an ostrich, was signed by South African Archbishop Desmond Tutu. The minimum bid is $650.